Mrs. Helen Louise Anderson Blevins was born September 7, 1928, in Gum Springs, AR to the late Mr. and Mrs. William and Lilly Anderson. She was the seventh of eight children consisting of seven girls and one boy. Raised in a Christian home, Mrs. Blevins was baptized and committed her life to Our Lord and Savior, Jesus Christ, at a very early age at Saint Ruth Baptist Church, Gum Springs, AR. She also attended school in Gum Springs. Mrs. Blevins and her family moved to Arkadelphia in 1952 where she united with Greater Pleasant Hill Baptist Church and worked for many years as a church usher. In 1972, she became a charter member of Mt. Olive Baptist Church, Arkadelphia, AR under the leadership of Rev. A. William Terry. In 1957, she was united in Holy Matrimony to Mr. Wiley Blevins. To this union, one child was born. Together, they raised, encouraged and supported eight children. Sister Blevins did not have the opportunity to advance her education; this motivated her to instill in her family the value of education, and prompted many of their children and grandchildren to continue their post high school education and to receive advanced/professional degrees. Mr. and Mrs. Blevins also instilled in their family the importance of hard work, love of family, sound character development and service to others. Throughout her adult life, Mrs. Blevins was lovingly known as “Mama Louise” to family and friends. She enjoyed traveling to support her children and grandchildren at their high school and university graduations, their marriages, the births of their children or just to enjoy a quiet vacation. She found tremendous joy in reading, traveling, gardening, shopping, cooking and talking with her children/grandchildren, friends and family. Her exciting travels took her to Germany, England, France, Belgium, Italy, Canada, and numerous US States including Hawaii which was a favorite. Mrs. Blevins retired from Levi Strauss Company of Arkadelphia but continued to work in the home health care field. Her zest for life and entertaining family and friends continued until her health began to fail. On a beautiful Sunday morning, February 19, 2017, at 8:42 a.m., one of God’s earthly angels entered into His Kingdom. All siblings, except one, predeceased her. Mrs. Blevins leaves to cherish her memory her husband of 59 years, Mr. Wiley Blevins; three sons: Deacon Charles E. (Elaine) Williams, Sr. of Sugarland, TX; Attorney at Law Larry D. (Doris) Williams of Springfield, VA and Michael Smith (special care giver) of Arkadelphia, AR; one daughter, Wanda Blevins-Stephens of Little Rock, AR; two step sons; James H. Blevins of Dallas, TX and Andrew (Zandra) Blevins of Memphis, TN; two step- daughters; Lynell Stovall of Cary, NC and Patricia (Tommy) Hall of Dallas, TX; one sister, Erma Jean Bryant of Duncanville, TX; seven grandchildren (Nikki Smith, Charles Williams, Jr., Patrick Williams, Erica Eskridge, Michael Smith, Jr., Mitzi Langley, and Seyanna Stephens), eight great- grandchildren, many step-grandchildren and step great-grandchildren. 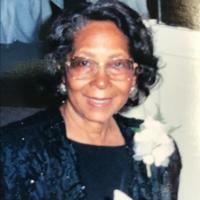 She leaves brothers-in-law: Matthew (Leona) Blevins of Chicago, IL, Samuel Blevins and Joseph Blevins both of Arkadelphia, AR and John Henry Blevins of San Diego, CA. She also leaves sisters-in-law: Dorothy Blevins of Arkadelphia, AR and Pearl Blevins of Little Rock, AR. She will also be missed by many nieces, nephews, cherished cousins, special friends Enoch and Mary Arnold, and other devoted loved ones. Funeral services are under the direction of Mitchell Funeral Home of 1809 Caddo Street, Arkadelphia, AR 71923. Public visitation will be Friday, February 24, 2017 at Mitchell Funeral Home from 11 am- 5 pm with friends and family hour from 6 p.m. -7 p.m. at Mt. Olive Baptist Church in Arkadelphia, AR where Rev. Llewellyn Terry, Sr. is Pastor and will serve as eulogist. The Funeral will be Saturday, February 25, 2017 at 1 p.m. at Greater Pleasant Hill Baptist Church in Arkadelphia, AR where Dr. Lewis A. Shepherd, Jr. is pastor and will serve as officiant. Interment will be at Rest Haven Cemetery in Arkadelphia, AR. Family and friends will fellowship and give tributes at Mt. Olive Baptist Church, Arkadelphia, AR 71923 on Friday, February 24, 2017 from 6 p.m.-7 p.m. Donations may be made to the Mt. Olive Baptist Church Scholarship fund at P.O. Box 404, Arkadelphia, AR 71923, in honor of Sister Helen Louise Blevins.